Another week, another shipped new feature. ??? This week we have got some great news if you’ve ever wanted to partner up with Dinghy. Today we launch our affiliates programme, and it’s packed with best in class features to ensure you, your communities and customers have everything they need. In addition to being a crucial part of our mission to fundamentally change insurance to be fair and flexible; as a Dinghy affiliate, you can earn direct income for every customer who you bring on board and then stays with us as an ongoing customer. This income can mount up quickly and become a decent supplement to your existing income streams. We also believe in trust and transparency, and that’s why we have built a custom dashboard for our affiliates to track and see the progress of the income they’re owed. You’ve always liked dashboards, you don’t know why but you do. Now you have a Dinghy Dash! 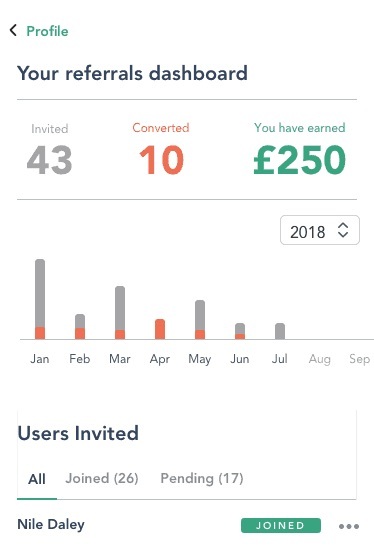 You’ll be able to log-in to your bespoke affiliate platform at any time and see how many of your referrals have signed up, which customers have stuck around, and most importantly for you; what you are owed and when you can expect to be paid. This means you will never be left in the dark about what’s going on with your signups and earnings and makes it a lot easier for you to forecast your own finances. You’ll also be able to contact our support team from your dashboard if you have any queries. You will get your own page which you can freely share at will, across all your channels. Your page ensures effortless on-boarding for your customers, and they will have the reassurance that you are a valid partner with us. Any customer who buys through your page will count towards your earnings. We will work with you to customise this page, which can also optionally double-up as a promotional or informational page about you or your business. We will supply you with different versions of our logo’s, founder pictures and copy about Dinghy that you can use to help your customers understand Dinghy and what we offer. As insurance is a regulated business, it is vital our affiliates stick to the guidelines supplied to ensure their customers get the correct information required. Ben Wilks has worked in insurance and technology for over 12 years. Having seen the trouble freelancers had getting insurance to suit their unique lifestyle he set about solving it. Ben is passionate about business as a force for social good. When not making insurance better, Ben spends his time on water, whether liquid or snow state. In 2017 he co-founded getdinghy.com, a B Corp (pending) insurance provider that specialises in freelancer insurance.